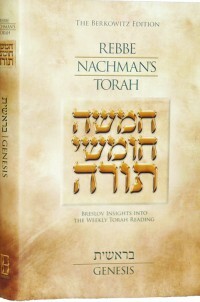 from Rebbe Nachman's Torah (editor). The Pentateuch begins with the letter Bet (ב) and ends with the letter Lamed (ל). Together, these letters the word LeV (לב), “heart.” This indicates that the Torah represents the heart, which is the dwelling place of the spirit (LM I, 10:7). The more we align ourselves with the Torah, the more fully are we able to develop our spirit. The gematria of the word LeV is 32, and God’s Holy Name, Elohim, appears 32 times in the account of Creation (LM I, 19:9). This teaches that when we attune our hearts to God, we are able to perceive Him via every facet of Creation. “In the beginning…” This may be translated as “for the sake of the head.” The world was created for the sake of Israel, which is its head (Midrash). When God created the world, He anticipated the pride and joy that He would derive from the good deeds of His nation, Israel. He thus created everything in the world in accordance with how it would reflect that pride and joy (LM I, 17:1). Therefore, every Jew must be aware of how important he is in God’s eyes, and know that he reflects the beauty of Creation. Moses did us a great favor by beginning the Torah with the simple words, “In the beginning, God created the heavens and earth,” for in this way he provided us with a model of faith that involves no sophistication or philosophy (RNW #219). The world was created principally for the sake of testing people’s faith. Rebbe Nachman once told a follower of his who was experiencing doubts that all of creation came into being because God saw that there would be people who despite being plagued by confusion would cling to our holy faith. God saw that these people would overcome their questions and remain strong in their beliefs, and it was for them that He created the world (RNW #222). “I [wisdom] was with Him as an amon — a nursling” (Proverbs 8:30). Do not read amon but oman—a blueprint (Midrash). The Torah is the blueprint of the world. Everything is sustained by combinations of letters in the Torah (LM I, 33:3). Therefore, a person can always find the Torah, which provides a pathway to God, in whatever exists in Creation. There is “potential creation” and “actualized creation.” Prayer, a request that God grant us something, is “potential creation.” Torah, on the other hand, which is something tangible, is “actualized creation.” Through prayer we can come to an understanding of Torah. Prayer leads us to our goals, and Torah is their actualization (LM I, 8:7). The verse states, “[Trust] in Yah Hashem, the Rock of worlds” (Isaiah 26:4). The Divine name YaH (יה) is composed of the first two letters of the Tetragrammaton. These two letters correspond to the Torah as follows. Yod represents the wisdom and intellect of the Torah (Yod corresponds to Chokhmah—see Appendix). Heh, which has the numerical value of 5,corresponds to the Five Books of the Torah, as well as to the five classes of consonants that appear in the Torah (guttural, palatal, lingual, dental and labial). A person who utilizes his three powers of intellect (Chokhmah, Binah and Daat) and his power of speech to study Torah truly becomes a human being--Adam. The name YaH has the numerical value 15. Man possesses three powers of intellect: thus, the word Adam has the numerical value of YaH multiplied by 3: 45 (also, the Heh can be expanded in three ways—see Appendix). Therefore, the verse from Isaiah may be understood as stating that “with the Torah, God created all of the universes for the sake of Man” (LM I, 101). The Talmud reports on a dispute as to when the world was brought into being. Rabbi Eliezer states that it was created in the month of Tishrei and Rabbi Yehoshua claims that it was created in Nissan (Rosh HaShanah 10b). The word Bereishit—“in the beginning”—can be understood as alluding to these two views. This word is composed of the letter Bet (ב, which has a numerical value of 2), followed by the word reishit (ראשית), “beginning.” It may thus be translated as “two beginnings”—i.e., Nissan and Tishrei (LM I, 49:6). Because these months represent new beginnings, they are both propitious for repentance. Thus, with the word Bereishit, the Torah indicates the importance of striving for the awe of God. With this awe, a person can attain great levels of humility before God, so that [even if he falls] he will always return to Him (LM II, 72; LM I, 38). Also, YaRAi BoSheT—“awe-humility”—indicates that a person’s humility—which is due to his understanding of the awesomeness of God—inspires him to fear God (LM I, 22:10). As noted earlier, the word Bereishit may be read as bet reishit. Bet may be itself be read as the word bayit—“home”—and the word reishit may be understood as referring to the Torah. Thus, the word Bereishit teaches us that a person who builds his life on Torah principles brings benefit to his home. This is reflected in the fact that, when we return to our homes following the holiday of Sukkot, we begin reading the Torah from Bereishit (LM I, 266). The letters of the word Bereishit (בראשית) can be rearranged to form the phrase RoASh BaYiT (ראש בית), “head of the house.” The “head” refers to the tzaddik and the “house” to the world. A person’s first step in drawing close to God should be to seek out the tzaddik (LM II, 67).